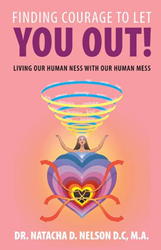 Dr. Natacha D. Nelson D.C, M.A., marks her publishing debut with the release of “Finding Courage to Let You Out: Living Our Human NESS with Our Human MESS” (published by Balboa Press). Inspired by her personal story, the self-help book teaches readers to let go of the shame, guilt and humiliation of their past to be free to live a better life. Candid and raw in telling, Nelson shares her struggle and reconciliation with addiction, depression and anxiety, detailing the experiences along with what was going on in her mind. In the book, readers witness her pain, the failures and consequences that she has faced in life. She also openly reveals the intense conflict she felt about her parents, without glossing over or denying the truth. Nelson offers the book to those affected, that they may be able to make sense of what is going on and to be able to survive, and for the people who are watching to have a better understanding. To purchase and know more about the book, readers can visit https://www.amazon.com/Finding-Courage-Let-You-Out/dp/1982218681. By Dr. Natacha D. Nelson D.C, M.A. Dr. Natacha D. Nelson D.C, M.A., has dedicated her career to understanding the connections between physical, mental, emotional and spiritual well-being through principles of chiropractic and spiritual psychology. For 20 years, she has worked in private practice, helping thousands of patients understand and care for their body and health. She lives in Los Angeles, with her daughter, where she continues her work as a mental health and wellness consultant and educator. Readers can visit http://www.lifedoctor.guru for more information on developing personal or professional mental health and wellness program.